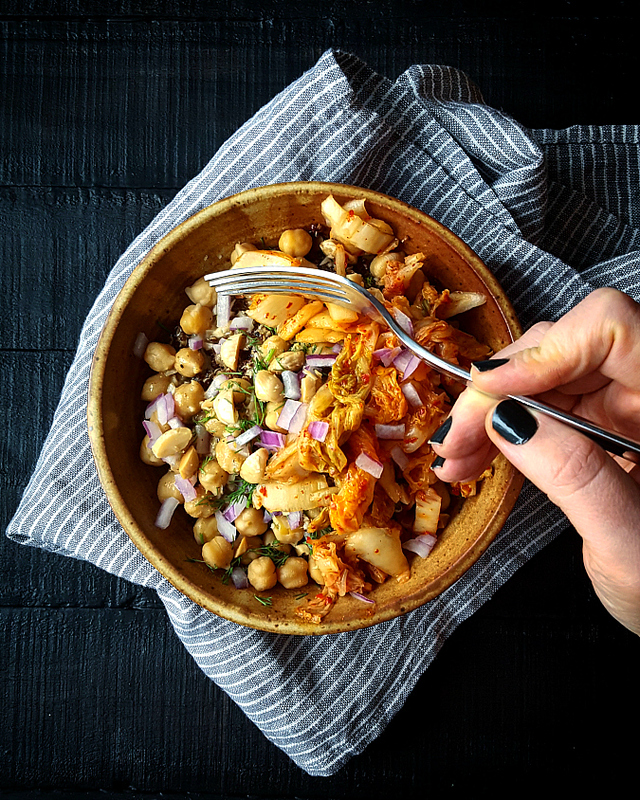 This Quinoa & Chickpea Bowl With Kimchi is a super quick, delicious and versatile Meatless Monday recipe you can make for lunch or dinner and have leftovers for the next few days. This is not really a recipe. It's more of an idea or a guide. 1) Start with quinoa: I sauteed mine in a bit of olive oil before topping it with boiled water and cooking till tender. It takes about 20 minutes. Use red or white quinoa, or mix it up. 2) I topped the cooked quinoa with chickpeas I made in my pressure cooker. You can use canned ones. 3) For the dressing, I mixed mustard with lemon juice, olive oil, a finely minced garlic clove, splash of red wine vinegar and salt & pepper. I used a larger amount of lemon juice and vinegar than olive oil for a more acidic taste. 4) Pour the dressing over the warm quinoa and chickpeas mixture so that it gets absorbed faster! 5) Now for the fun toppings: think texture, color, and flavor. I chose dill, red onions, kimchi and Marcona almonds.